For nearly a decade, Safe Living Solutions, LLC has been helping people increase the accessibility and usability of their homes in the Piedmont Triad of NC. We are passionate about helping our neighbors create the homes they need for any stage of their life. Safe Living Solutions is a premiere provider of home accessibility products and accessible home remodeling services. They offer a wide range of accessibility products, including stair lifts, vertical platform lifts, ramps, incline lifts and vehicle lifts. Their construction services include bathroom renovation, kitchen remodeling, home additions and other accessible remodeling. Whether you’re looking to install a chair lift or vertical platform lift in your home, or create a fully accessible bathroom or kitchen to meet your needs, Safe Living Solutions is the local remodeling contractor and factory trained installer you can trust. Our professional accessible home remodeling and accessibility product installation teams in the Piedmont Triad are licensed, insured, trained and experienced. We help families in Winston-Salem, High Point, Greensboro and surrounding areas create the homes they need. So, their homes work for them and make life easier. Our North Carolina remodel professionals perform the highest quality accessible home design and renovation services. We pride ourselves on first class workmanship and strive for the highest in customer satisfaction scores. If you are in need of home accessibility products or home modifications, then look no further than Safe Living Solutions. 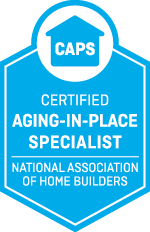 High Point - Our remodeling and accessibility professionals are experienced and capable of helping you create the perfect High Point home for your life. Winston-Salem - In need of a stair lift or accessible bathroom? Our factory trained installers and home remodeling pros can help you in Winston-Salem. Greensboro - Our Greensboro vertical platform lift installers and handicap accessibility professionals can help you tackle that home modifications. With all the home contractors and product installers in the Piedmont Triad, you should not settle for less than the best. Our teams work to the highest standard, while guiding you through the entire process, so you can get the results you want for your home.